A fiber Bragg grating is periodic variation in the refractive index in a small section of optical fiber . As light propagates along the fiber a very narrow range of wavelengths is reflected by the Bragg grating, while all other wavelengths are transmitted through the grating. 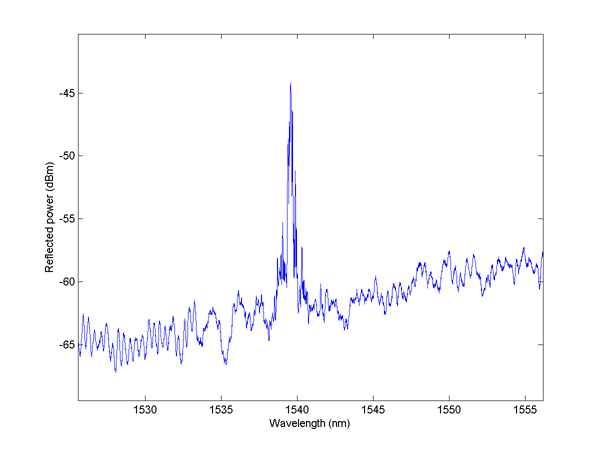 The center of this reflected band is called the Bragg wavelength. Because the Bragg wavelength can be affected by external stimuli, Fiber Bragg gratings are useful in creation of low insertion loss optical sensors. These sensors are light weight and have the same dimensions as the optical fiber. They are also inert to electromagnetic interference. Fiber Bragg grating sensors can be used as strain gauges in civil structures and aircraft. Other uses include chemical, temperature and pressure monitoring in a variety of applications where traditional sensors might not be desirable. Fiber Bragg Gratings are widely used as strain gauges. Under stress, the period of a FBG increases due to the physical stretching of the optical fiber. 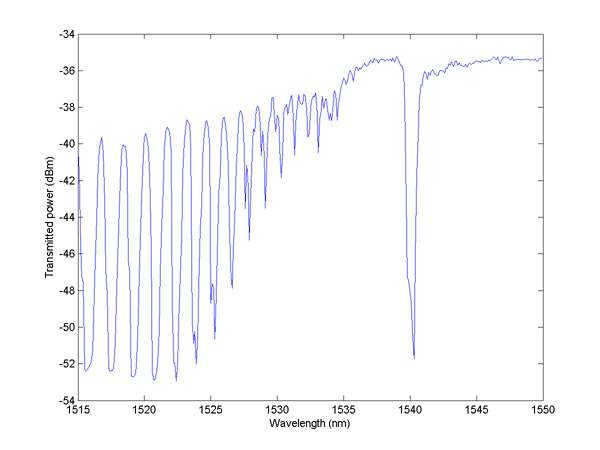 This change results in a shift in the Bragg wavelength. Similarly, temperature sensors make use of thermal expansion to change the grating period. In chemical sensing the Fiber Bragg grating is coated with a polymer, and as chemicals diffuse into the polymer the average refractive index of the grating changes shifting the Bragg wavelength. The core in an optical fiber is photosensitive to Ultra Violet (UV) light. Thus, exposure to an intense interference pattern of UV light causes localized changes in the index of refraction of the fiber core. These localized changes form the periodic variation in the refractive index necessary for an FBG. The grating will remain unchanged even with repeated use. However, at elevated temperatures the FBG �washes� out. To overcome this phenomena, the BYU Optics lab has focused research on producing Bragg gratings that are physically etched onto the fiber. We have fabricated surface-relief fiber Bragg gratings that operate at temperatures of 1100 degrees centigrade and are currently focusing on increasing their performance.